This FAQ page is updated regularly to address new questions you may have. We seek to respond to your questions through this FAQ webpage, as well as by hosting seminars and educational events and writing briefing papers that address questions you have about specific topics more in-depth. Check our events page to see what educational event we have going on for you right now. Download a PDF of the FAQs to share with your peers. What is the Greater Santa Fe Fireshed Coalition and what do you do? Who is involved in the GSFFC? Who owns the Santa Fe Fireshed? Why do we need to restore our forests in the first place? Why would we want fewer trees in the forest? Will prescribed burning and thinning trees prevent wildfires from occurring? After thinning and prescribed fire, what does the forest look like? Where does the GSFFC get its funding? How does forest restoration affect the economy? How are forest treatments sustainable? What can I do to protect my home from a wildfire or after-fire effects? What will you do to reduce air quality impacts during prescribed burns? How does wildlife respond to prescribed fire? How does tree thinning reduce the threat from destructive insects and diseases? As an interested citizen, how can I be involved in the GSFFC’s work? The City of Santa Fe's Water Resource Division, Alan Hook, giving a talk to the Wildland Urban Interface Summit field trip in the Municipal Watershed. The GSFFC is an informal collaborative organization of landowners and stakeholders focused on the health and well-being of forests, watersheds, wildlife, and communities in the southern Sangre de Cristo Mountains. Through work to address wildfire, the Coalition takes a pro-active approach to improving the long-term resilience of these resources. The Coalition brings together federal, state, tribal and local government agencies who manage natural resources, private non-governmental conservation and environmental organizations, business interests and recreation groups. Coalition members meet quarterly to discuss strategies for restoring the watersheds that encompass national forest, tribal land, a state park and private land, extending from Santa Fe across the mountains to Pecos, and north to the Tesuque and Nambé Pueblos, the area that GSFFC calls the Santa Fe Fireshed. The Coalition does not own any land in the project area, nor does the GSFFC carry out any projects itself. These activities are planned and implemented by coalition members. Often, members can benefit by coordinating with neighbors, to carry out projects more efficiently, and this coordination can be discussed at the GSFFC meetings. Coalition members also engage in educational programming, and collaborate with other GSFFC partners to promote educational programs. These programs are aimed at various audiences, to help the public understand the rationale for forest restoration and management and other activities to reduce the risk of catastrophic wildfires and make communities and resources more resilient to wildfire. To view the Mission and Vision Statements of the GSFFC, see: http://www.santafefireshed.org/get-involved/ and click on the Mission and Vision button at the bottom of the page. The GSFFC includes three levels of participation: partners, advisors and contacts. Advisors are individuals and representatives of organizations who participate occasionally in the GSFFC, often for specific purposes. Advisors may observe and contribute to the Coalition meetings, and may assist the Coalition in projects. Advisors also may participate on GSFFC committees. The primary purpose of the GSFFC is to coordinate forest and watershed restoration projects within the Fireshed area, and to provide education and outreach for the public about forest management issues and steps they can take to ensure healthier forests and mitigate their risk from catastrophic wildfires. Participation in the GSFFC implies agreement with the principles of the organization, but does not obligate an organization to take any actions. Ryan Swazohinds, Pueblo of Tesuque, gives a talk at a field trip in the Fireshed. The Pueblo of Tesuque has been a long-standing partner of the GSFFC. Fuel on the ground awaiting treatment in the Fireshed. Lands within the Santa Fe Fireshed landscape area are owned, managed, or held in trust by many different entities. These include, among others, the the Santa Fe National Forest; the State of New Mexico; the Pueblo of Tesuque; the City of Santa Fe; and many private landowners. Private landowners include 1) homeowners, some of whom occupy their residences permanently and some who have cabins or second homes in the area, 2) The Nature Conservancy (a partner in the GSFFC), which manages the Santa Fe Canyon Preserve, and 3) churches and youth groups, which have camps or retreat centers. Some private entities have a stake in the Fireshed through leases, such as Ski Santa Fe (formerly known as the Santa Fe Ski Basin). The company that operates the ski basin owns the equipment and buildings, but the land is managed by the U.S. Forest Service (USFS) for the public. The term “fireshed” refers to an area where social and ecological concerns regarding wildfire overlap and are intertwined. Wildfire moves across the land based on fuels wind and terrain and is not bound by political or watershed boundaries. Because of these aspects and in order to take steps to be more fire adapted, we need to think on the scale of a wildfire. The Fireshed Coaliton recognizes the likely risk and spread of wildfire, supporting the integration of this recognition into land management decisions. It also seeks to convey the idea that in a fire-dependent ecosystem, fire periodically moves across the landscape and is an important part of healthy ecological functioning. As a wildfire burns, it crosses property boundaries indiscriminately. Thus, to manage nature in a fire-dependent ecosystem, everyone with a stake in the area must collaborate to manage the whole area, including all the land and resources across the entire landscape, for common purposes. These mutually beneficial purposes include reducing the risk of disastrous events that have negative effects on everyone with an interest in the area, such as a large wildfire, flooding and debris flows, or an outbreak of insects or diseases which can kill trees and alter the ecosystem. The partners in the GSFFC apply principles drawn from adaptive management and restoration ecology to address risks posed by catastrophic events. The basic approach is to let nature be our guide, and to manage the area with strategic, targeted interventions that mimic natural processes, then let nature do most of the work. Monitoring the results and adapting additional interventions based on data collected through monitoring allows for constant adjustments and improvements in the management strategy. The GSFFC does not own any land within the Fireshed and is not responsible for making any land use or forest/watershed management decisions on any land within the Fireshed. Collaboration refers to an approach to participatory land management that brings together organizations with diverse interests to discuss and coordinate projects that are mutually beneficial. Public participation has been built into the management of government managed natural resources for more than four decades. At the federal level, the National Forest Management Act of 1976 (NFMA) (16 U.S.C. §§ 1600 to 1687) and the Federal Land Policy Management Act of 1976 (FLPMA) (43 U.S.C. §§ 1701 to 1787) require the USFS and the Bureau of Land Management (BLM), respectively, to engage the public in the development of land and resource management plans. Other laws require federal agencies to consult with others, including other federal agencies, state agencies, tribes and private organizations, as they develop and implement plans for specific projects, including forest and watershed restoration projects. Collaboration brings various forms of public participation together into one process. The Healthy Forests Restoration Act of 2003 (HFRA) (16 U.S.C. §§ 6501 to 6591c) requires collaboration in planning, prioritizing and implementing hazardous fuel reduction (HFR) projects, in preparing Community Wildfire Protection Plans (CWPPs), and in prioritizing projects on federal lands that protect communities and watersheds at risk of wildfires. Collaboration draws together individuals and groups with authority to make decisions about land management, including public land management agencies, private landowners and renters, businesses and non-governmental organizations that own and manage forest land. Organizations that represent various interests the public has in the Fireshed also participate. Participants meet as a collaborative organization 1) to discuss the projects that participants are carrying out to restore their lands and resources and to protect communities and watersheds, 2) to raise funds that can be allocated towards fuel reduction, community risk mitigation, and forest restoration projects, and 3) to build relationships that facilitate future work. Some collaborative groups, including the GSFFC, also carry out educational projects to engage in a dialogue with the public and to build understanding around these complex forest, watershed, and community issues. An important purpose of collaboration is to make the planning and implementation of forest restoration and community risk mitigation more efficient. In the past, decisions on public lands were made without comprehensive examination of issues and interests, and once projects were proposed, groups often ended up in court with parties that contested their projects. Court cases can drag out over years or even decades. Collaboration brings parties together up front to discuss their interests and goals, and to work out differences before carrying out projects, so that all interests can be represented in the design and execution of forest, watershed, and community risk mitigation projects. While the conversations and meetings that collaborators attend do take time and may delay the initiation of projects, once the project is underway it generally is completed with fewer objections and lawsuits, saving time and resources for all involved. And, through the process of collaboration, partners build trust and understanding, and over time they can go through the process of planning and carrying out projects more quickly and with less contention. Historians and ecologists point to three major factors that altered the trajectory of ponderosa pine forests, and they all began around the turn of the twentieth century: 1) a colossal increase in grazing animals, which consumed understory grass and exacerbated erosion; 2) clear-cutting forests, which removed nearly all the mature trees left behind dense, uniform stands of trees; and 3) an increased emphasis on fire suppression. [iv] A century later, saplings have grown into dense “doghair” thickets, drought and a warming climate have sucked moisture from the trees, thousands of houses have been constructed within the forest, and each spring we brace for what could be, once again, the most damaging fire season on record. [i] Dods, R. R. (2002). "The death of Smokey Bear: the ecodisaster myth and forest management practices in prehistoric North America." World Archaeology 33(3): 475-487. [ii] Friederici, P., ed. (2003). Ecological restoration of southwestern Ponderosa pine forests. Washington, D.C.: Island Press. [iii] Graham, R. T., McCaffrey, S., and Jain, T. B. (2004). “Science basis for changing forest structure to modify wildlife behavior and severity.” General Technical Report, RMRS-GTR-120. I like having a lot of trees around my house for privacy; why would we want fewer trees in the forest? Many of us we made the choice to live in or near the forest. Research shows, however, that the forests of the Sangre de Cristo Mountains are much more dense than they were 200 years ago. Without frequent fire, much of our forest has become overcrowded, unhealthy and prone to large, high severity wildfires. New Mexico is also getting warmer and drier, which means that there will be less water available to support forests. Research and experience show that more open forests are better able to survive drought [i]. Overdense forests also prevent precious snow from reaching the ground and recharging the aquifer on which we depend. Dense stands of trees around our homes pose a risk to neighborhoods as well as to forest health. By carefully removing some of the trees, we can make the forest healthier, reduce community wildfire risk, and create safer conditions for emergency first responders. Implementing prescribed fire and thinning will not prevent wildfires from occurring. Prescribed fire and mechanical thinning will not eliminate wildfire risk, but there is ample scientific evidence that these actions will help lower the risk, especially if done in the right place using the right methods (to read more about fire and forest ecology, see: http://www.santafefireshed.org/science/). The GSFFC recognizes that wildfire plays an important and beneficial role in many of our forested ecosystems and our goal is to thin and burn where we know there have been frequent-fire regimes. The Coalition advocates for the use of best science and encourages the exchange of information amongst natural resource managers in order to continually improve treatment methods and to maximize the potential for success. A prescribed pile burn in the Aztec Springs Neighborhood up Hyde Park road. [i] Fulé, P. Z., T. W. Swetnam, P. M. Brown, D. A. Falk, D. L. Peterson, C. D. Allen, G. H. Aplet, M. A. Battaglia, D. Binkley, C. Farris, R. E. Keane, E. Q. Margolis, H. Grissino-Mayer, C. Miller, C. H. Sieg, C. Skinner, S. L. Stephens, and A. Taylor. (2014). “Unsupported inferences of high-severity fire in historical dry forests of the western United States: response to Williams and Baker.” Global Ecology and Biogeography 23(7): 825-830. [iii] Kennedy, M. C. and Johnson, M. C. (2014). “Fuel treatment prescriptions alter spatial patterns of fire severity around the wildland-urban interface during the Wallow Fire, Arizona, USA.” Forest Ecology and Management 318: 122-132; Moritz, M. A. et al. “Learning to coexist with wildfire.” Nature 515: 58-66. One year after a prescribed broadcast burn near Angel Fire, NM. During and immediately after active management, things can look messy with slash on the ground or what looks like the residue of a camp fire left from a managed pile burn. Wait a year or two and you will see a more diverse forest, with new growth and grass recruitment evident. A healthy ponderosa pine forest houses trees of all sizes, open meadows, understory grasses, and a diverse array of flowers. Healthy trees are also less likely to succumb to disease and insect infestations, such as bark beetle outbreaks. Many people who live in the forest are understandably reluctant to cut trees or burn the forest understory; it can be shocking to cut a tree of any size or watch a sapling burn. Aversion to fire is common and, in some ways, unavoidable. However, foresters spend most of their days thinking in decades instead of days. Years down the road, a well-planned restoration project, in a place that truly needs it, will yield a forest that is both beautiful and more resilient to drought and insects. Not all forests need to be thinned or burned, but when it’s needed, those management efforts can do wonders for the ecology and aesthetics of our landscape, while protecting us from catastrophic wildfire. I have heard that thinning or prescribed burning is very expensive. Where does the GSFFC get its funding? The GSFFC does not implement treatments. Rather, the partner organizations and agencies that participate in this collaborative group implement treatments using their own funding, which comes from a variety of sources. Land managing agencies rely on their own funding, while treatments on private land are funded by a combination of private funds and grant monies offered by agencies. In other cases, funding comes from private sources. For example, The Nature Conservancy in New Mexico’s Rio Grande Water Fund is aimed at making the Rio Grande Watershed and the forests that feed it more resilient to wildfire. The comprehensive plan brings together private donors, corporations, and public funding in a comprehensive 20-year plan to restore large tracts of New Mexico’s forests and watersheds. Programs for forest restoration must raise money up front, but the long-term economic benefit is enormous. The U.S. Geologic Survey has found that a $1 million investment in priority forest restoration programs results in a $2.4-3.2 million local economic boost. [i] The Water Fund has found that it costs on average $700 to thin one acre of forest, whereas the economic impact of one acre affected by wildfire can be well over $2,000. For example, the 2011 Las Conchas fire is estimated to have cost $246 million, and expenses—wildfire suppression costs, post-fire flooding, damage to water and power infrastructure, reduced tourism, and property loss—are still accruing. [ii] In contrast, thinning and prescribed fire can reduce the risk of a catastrophic wildfire for a fraction of the cost of fighting that same wildfire, while maintaining the integrity of our watershed. [ii] Rio Grande Water Fund: Comprehensive Plan. Forest Stewards Youth Corps member learns about a local timber company and gets hands-on experience peeling vigas. Corps members are employed from rural NM communities to work on conservation projects on public lands. Many of these youth go on to get degrees in natural resource management. How are forest treatments (thinning, prescribed fires, managed wildfires) sustainable? Most forest treatments, also known as management actions designed to benefit one or several ecosystem attributes, align with the New Mexico Forest Restoration Principles). These principles were developed by a diverse group of stakeholders including federal agencies, businesses, state agencies, and conservation groups like The Nature Conservancy, the Center for Biological Diversity, Sierra Club, the Forest Guardians (now WildEarth Guardians), and the Forest Guild (now the Forest Stewards Guild). These principles still form the foundation for the work these agencies and organizations do to create resilient landscapes and communities. Specifically the principles discuss the concept of sustainability as it relates to a balance when addressing native forest pathogens like mistletoe and ecological sustainability to achieve restoration both of structure (vegetation arrangement, size, and composition) and processes like fire and flooding. Many of the individuals involved in the development of the principles are directly involved in the GSFF and bring that perspective to this landscape. What the New Mexico Forest Restoration Principles don’t discuss is wildfire managed for resource benefit. This is when land managers and a wildfire incident commander identify that all or part of a particular wildfire is having a net resource benefit and together, they decide to manage the wildfire to enhance that effect. Increasingly this is becoming a more common treatment tool used by managers in the Southwest. (See SW Fire Summary). For example, in 2016, 55% of wildfires in the Southwest were managed with strategies other than full suppression. This indicates that fire is being introduced back into fire dependent ecosystems at a meaningful scale with largely beneficial effects when such a strategy aligns with firefighter and community safety, available resources, weather, terrain, and other factors. Managed wildfire is a sustainable approach to forest treatments since every year there are thousands of natural ignitions. These natural ignitions present both risk and opportunity. When creating and implementing treatments that are designed to restore forest or woodland structure (tree densities or spatial distribution), return an ecosystem process like fire, or reduce risk of uncharacteristic wildfire to a forest or community, it is important to factor in that these efforts are stages in a process and often require maintenance. For example, a thinning treatment will generate woody debris. That debris will need to be removed, chipped, or piled. Those piles will need to be burned. After those piles are burned, that treatment will likely not be complete until low to moderate intensity wildfire is introduced across the area. After that, the whole series of treatments will need to be maintained, likely with prescribed fire at intervals (see: A 700-yr history of fire and streamflow) appropriate to the ecosystem and site. The Home Hazard Assessment Guidebook can be found here and is a free tool for assessing where wildfire risk my be on your property. Homeowners have many options to reduce the risk of wildfire to their homes and families. Creating defensible space around your home is a great place to start. Defensible space involves removing flammable vegetation and materials that are in close proximity to your house. Defensible space breaks up the continuity of ground fuels and the tree canopy so that if fire, or wind-carried embers are heading towards your house, they can more easily be extinguished. Even something as simple as a 3-foot buffer of landscaping rock can stop a ground fire from reaching your house. 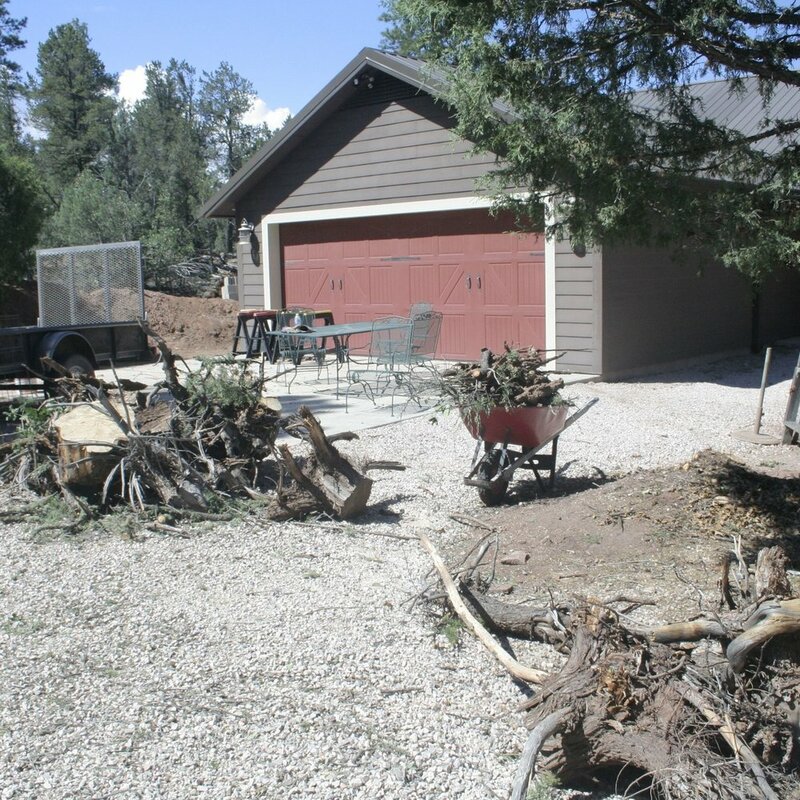 For many properties, keeping grass mowed and removing vegetation such as shrubs and small trees is also necessary to make a home resistant to wildfire. On your home itself, screening vents and eaves to keep embers from gathering under them, bringing patio furniture cushions inside and closing windows before evacuating, and keeping gutters and roofs clear of pine needles and leaves will all help protect a home from an ember shower. The Home Hazard Assessment Guidebook, which can be found here, has more tips for homeowners on how they can reduce the wildfire risk to their homes and properties. Smoke impacts are a serious concern for prescribed fire practitioners. Smoke can cause and exacerbate health conditions, especially for those already predisposed to respiratory ailments. However, living in the fire-prone area of northern New Mexico, wildfire and smoke are not only inevitable, but natural. By intentionally conducting controlled fire we are reintroducing fire under carefully prescribed conditions that limit impacts of smoke compared to the uncontrolled conditions of a wildfire. One of the many purposes of using prescribed fire is to limit the possibility of large wildfire events and their great smoke impacts. Smoke mitigation is considered from the beginning planning phases all the way to the day of a burn. A plan is created that defines communities that would be impacted and identifies the strict conditions under which a burn must be carried out to minimize these impacts. 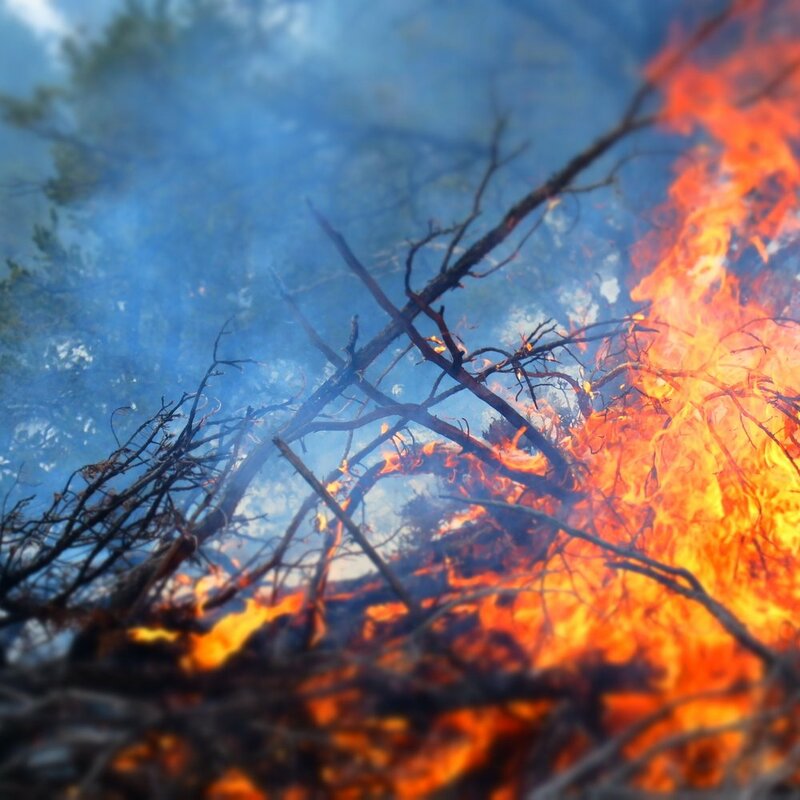 Fire managers must obtain a permit from the New Mexico Environment Department’s Air Quality Bureau and closely monitor conditions to determine the optimal time to burn. During a prescribed fire, smoke is closely monitored and if adverse impacts are observed the burn may be postponed or lighting patterns may be changed to reduce the generation of smoke. Some smoke is unavoidable during prescribed fire operations, so the GSFFC created a High Efficiency Particulate Arrestance (HEPA) filter loan system to assist people with smoke sensitivities. HEPA filters have been shown to greatly reduce the impacts of smoke inside your home. For more information please visit the GSFFC HEPA filter loan page. Prescribed burns comply with strict air quality guidelines and timing. A rabbit pokes her head out of a downed log in a treatment area. Downed wood and fire scarred trees provide excellent habitat for many small woodland creatures. Most animals in our forests are well adapted to fire, especially a low-intensity fire like a prescribed burn, and multiple studies have shown that prescribed fire does not negatively impact wildlife populations. [i] Upon detecting a nearby fire, most animals will simply run away, fly away, burrow into the ground, or retreat to a safe place such as a stream or bare field. A prescribed fire moves very slowly across the landscape, and the flames are low, causing virtually no risk to large vertebrate animals. Some creatures will perish, especially insects and other invertebrates, but their populations quickly rebound after a fire. [ii] Most of the negative effects only last during treatment and shortly after as habitats begin to respond to the treatment. Moreover, many plant and animal species directly benefit from fire. Fire helps to create a “patchy” landscape in dry forests—trees of varying ages, open meadows, and so on—and the “edges” between patches are magnets for biodiversity. A diversity of available habitats allows for most of the species to find what they need. Certain ground-dwelling species like the gopher tortoise, which is specific to the Southwest, and ground-nesting species like Bachman's sparrow require bare ground and an herbaceous understory that are maintained by frequent surface fires. Woodpeckers depend on fire-generated features like snags (standing dead trees). [iii] And some tree species, like quaking aspen, need a large disturbance like fire in order to regenerate; aspen stands are not only a beautiful icon of the Santa Fe area, but also serve as bastions of biodiversity. [iv] Healthier habitats and populations are more resilient to stressors such as drought, insects and diseases. Finally, a primary goal of prescribed fire and tree thinning is to reduce the risk of hotter, larger wildfires that pose an immense threat to wildlife. Most species that live in our ponderosa pine and mixed-conifer forests respond better to low-intensity prescribed fire than to massive stand-replacing fire. [v] These bigger and hotter fires also damage soils by burning organic matter, breaking down soil structure, and reducing water retention. Damage to soil has a negative cascading effect on many plant and animal species. [vi] Large fires also change wildlife habitat in substantial and unpredictable ways. In summary, a low-intensity prescribed fire poses small short-term risks to wildlife, and these risks are far outweighted by the long-term benefits of a healthier forest system. [i] Gleason, K. M. and Gillette, S. (2009). “Myth Busting About Wildlife and Fire: Are Animals Getting Burned?” Fire Management Today 69(1): 26-28. [ii] Zielinski, S. (2014). "What do Wild Animals do in a Wildfire?" National Geographic website, July 22, 2014. nationalgeographic.com. [iii] Kennedy, P. L. and Fontaine, J. B. (2009). “Synthesis of knowledge on the effects of Fire and Fire Surrogates on Wildlife in U.S. Dry Forests.” Joint Fire Science Program, Oregon State University, Special Report 1096. [iv]Krasnow, K. & Stephens, S. (2015). "Evolving paradigms of aspen ecology and management: impacts of stand condition and fire severity on vegetation dynamics." Ecosphere 6(1): 1-16. [v] Kennedy & Fontaine (2009). In New Mexico, conifer bark beetles and dwarf mistletoe are the most significant insect and disease threats to forest health. Bark beetles frequently attack and kill stressed trees in overstocked forests and during droughts. Reducing tree density in a forest can reduce the risk of bark beetle-caused tree mortality and limit large-scale mortality from bark beetles. Tree thinning promotes individual tree health by reducing competition for water, nutrients, and sunlight, which allow trees, specifically pines, to better fight-off, or “pitch-out,” bark beetles. Increased sunlight, tree spacing, and wind flow in thinned stands are also not conducive for bark beetle attacks because it is detrimental to the beetles and disrupts their chemical communication. Creating groups and clumps of trees of different age classes with openings in between can reduce the spread of insects and disease between groups of trees and creates a mosaic on the landscape that doesn’t favor any specific bark beetle. Dense forest stands facilitate the spread of dwarf mistletoe. Dwarf mistletoe is a common parasitic plant on pines and Douglas-fir that causes irregular growth and growth loss of infected trees. Young trees can be killed by the parasite, and seedlings growing under a heavily infected canopy will most likely be infected and killed before reaching maturity. The ballistic seeds of dwarf mistletoe shoot out from infected trees to neighboring trees in the canopy and understory. Seeds are commonly propelled 10-15 feet from an infected tree, but they may travel up to 40 feet. Reducing tree density (i.e., increasing the distance between trees) in a forest can limit the spread of dwarf mistletoe. Tree thinning, or removal of severe dwarf mistletoe infections, can improve forest health and promote healthy regeneration in an area. Thinning can also mitigate the impact of root diseases by increasing vigor in remaining trees. A woodpecker pecked this tree to locate the beetle larvae living under the bark. Tree thinning promotes individual tree health. A field trip with forest and fire professional in the fireshed. You can join field trips, seminars and other events on our events page. The GSFFC and its partnering organizations are very interested in enhancing public involvement in realizing the mission and vision of the GSFFC. You can become involved in the GSFFC’s work in a number of ways. Second, you can monitor GSFFC projects and activities through our website, Facebook page and/or our Twitter feed. Fourth, you can attend events organized by the GSFFC or its partners, which provide more information about the Fireshed. For more information about GSFFC and partner activities, see the GSFFC website, Facebook page and/or Twitter feed. Fifth, you can speak to others about the GSFFC and what we are doing in the Fireshed. This includes conversations with your neighbors and friends, to help them better understand the science of forest restoration, as well as your elected representatives, community leaders, and the media to share your thoughts with others, including decision makers.